Gibson TB-5 De Luxe Model Tenor Banjo (1925), made in Kalamazoo, Michigan, serial # 8105-1, shaded maple finish, laminated maple rim and resonator, mahogany neck with ebony fingerboard, black hard shell case. 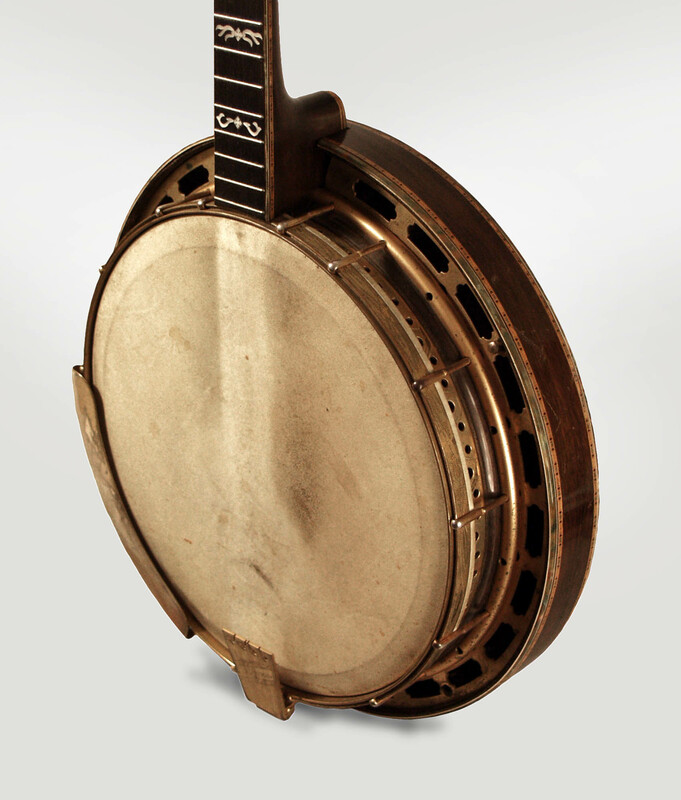 This is a very rare banjo, a remarkably lovely Gibson creation and a true 1920s period piece. The newly re-designed Mastertone TB-5 was the top-of-the-line banjo for Gibson in early 1925, and one of the first pieces in the then-newly redesigned resonator-and-flange banjo line. This early example was built not long after the new line was announced, most likely in the middle of 1925. 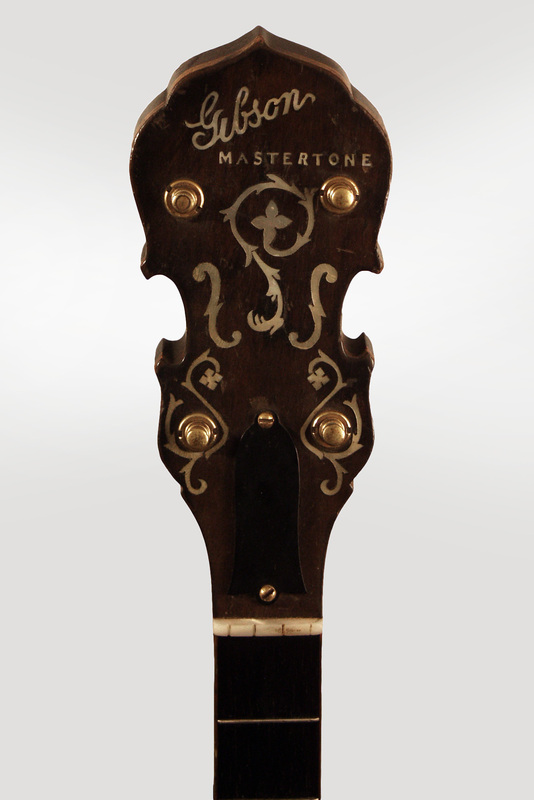 It is one of the first generation of the seminal Mastertones and carries specific early features including the individually lettered word "MASTERTONE" on the headstock face instead of typical fingerboard block. As might be expected, this is a very fancy instrument. All hardware except the internal tone ring components is gold-plated and engraved, in a very delicate pattern. The fingerboard is bound in green pearl celluloid and has colored wood underlay on the sides; the same pattern is used on both edges of the resonator. 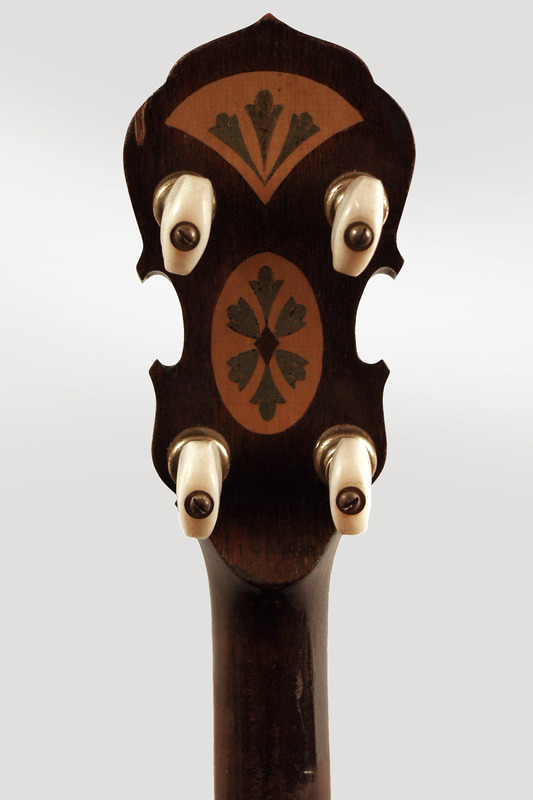 The fingerboard and headstock face have delicate wreath pattern pearl inlay, while the back of the headstock has colored wood inlay in a decorative floral pattern. The resonator also has two circles of colored wood marquetry inlaid on the back. The tuners are gold-plated Planets with pearl buttons, the tailpiece is a special Kersher Unique engraved "DeLuxe", a designation briefly applied to this model in the Gibson line. The tone ring itself is the older fully original Lloyd Loar designed ball-bearing arch-top Mastertone style, already in use for a couple of years by this point. While not favored by modern Bluegrass players, it does have an interesting if slightly darker and more mysterious tone than the later fittings that replaced it after 1927. 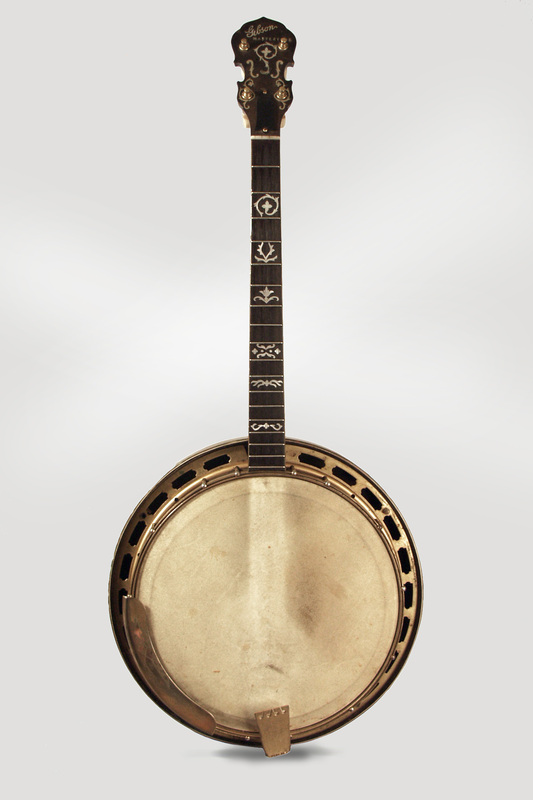 The scale length of this banjo is shorter than standard as well at 20 3/4", which was a Gibson catalog option aimed at their mandolin-playing clientele. 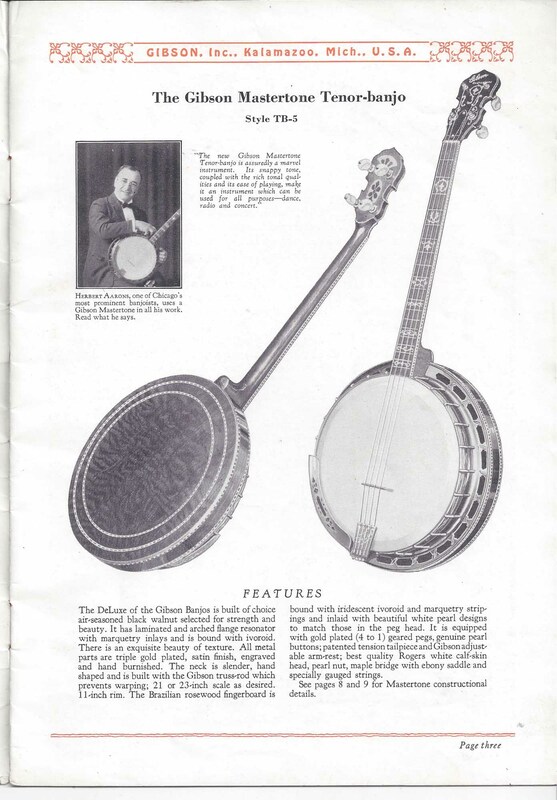 By 1925 most professional tenor banjos had adopted the long 23" scale pioneered by Paramount; while in many ways Gibson's new Mastertones took inspiration (to put it politely) from that brand, the optional short scale on this banjo is a continuation of earlier Gibsonite policy. The short scale makes it easier to play single-line melodies, but does not offer the same 'snap' as the longer neck's increased tension, which was what orchestra banjoists were looking for by the mid-'20s. 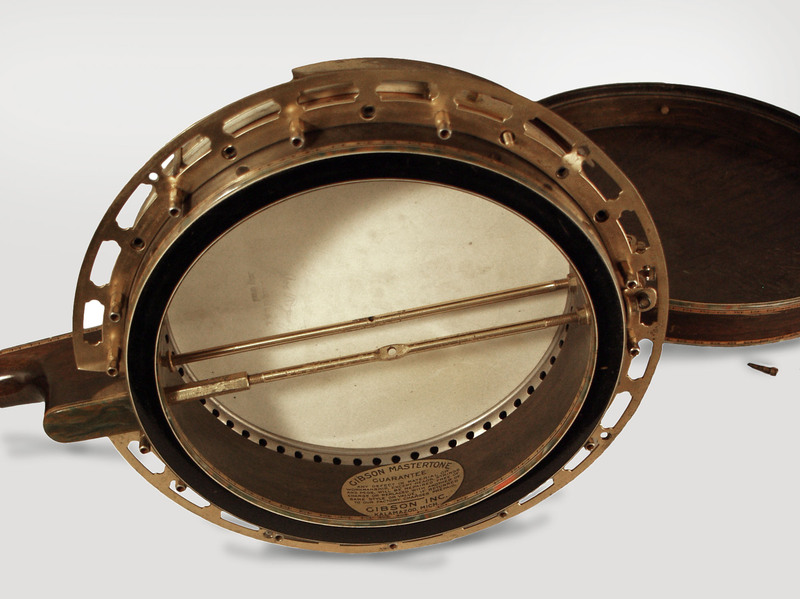 This TB-5 is essentially a transitional instrument, built while Gibson was desperately trying to adapt to the huge banjo market of the mid-'20s. With the mandolin rapidly losing popularity and the guitar not yet ascendant, Gibson had to re-think their mando-centric strategy or face extinction. 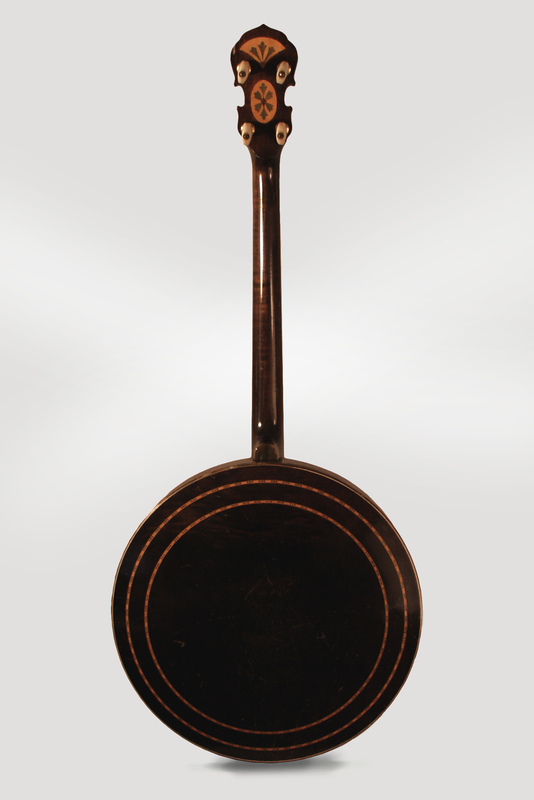 Their earlier mandolin-like "trapdoor" banjos were not very successful in dance orchestras, and this new-pattern Mastertone line was a make-or-break effort. This TB-5 represents the top of that first line, at $250.00 as expensive as the F-5 Master Model mandolin. While obviously not as sought-after (or expensive) today, the TB-5 is a wonderful piece of Gibson history and a lovely example of the company's artistry at arguable their greatest period. Overall length is 32 1/4 in. (81.9 cm. ), 11 in. (27.9 cm.) diameter head. Scale length is 20 3/4 in. (527 mm.). Width of nut is 1 1/4 in. (32 mm.). 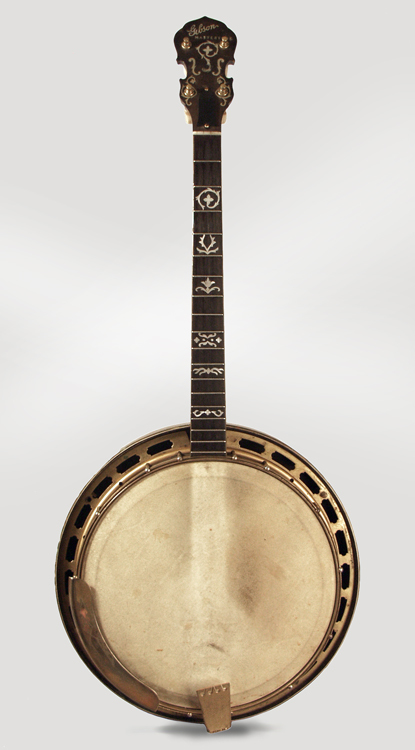 While we rarely offer instruments of this caliber in unrestored condition, this banjo is a fairly unique piece with different options that would appeal to different styles of player. As much of the interest in the early Gibson Mastertone tenor banjos today lies in their adaptability to 5-string format, we have elected to leave this piece as found rather than complete a set up in its original tenor form. That said, it would make a fantastic Irish tenor, as the shorter neck is perfect for the style. We would be happy to set it up in that format, or as a standard tuned tenor if requested. The banjo is currently missing 11 of the original gold-plated hooks, tailpiece nut and two of the resonator bolts, but all the remaining parts are original. The ball bearings internally are also not a complete set, though most are present. There is wear overall to the gold plating, most notably on the armrest, and a decent amount of finish wear to the back of the resonator. The head is a solid old period Rodgers Daisy Brand, which is fairly dirty and most users would likely elect to replace, though we'd guess it still has an excellent period sound to offer. The neck is solid with no repairs; the finish is rubbed off the back around the first position and the frets show some moderate wear. Overall, the rim would be ready to set up for conversion with the replacement tone ring, neck, and head of choice, or the banjo could be set up as a tenor with minimal intrusion depending on the hook and head options requested. Overall a lovely old instrument, a remarkable example of Gibson's finest (and some would say least tacky) banjo work of the 1920s. Includes a later (probably 1940s) full-scale tenor HSC in very good condition. Unrestored. Overall Excellent Historic Condition.